Do you wish someone would handle marketing for you—so you can focus more on what you do best? I know something about you. I know you believe in your business and the impact it provides to people in the world. But this business keeps you busy. Not to mention, you have a life outside of your business. You have family, friends, and responsibilities that all demand your attention. Doing a product launch campaign. You need a single marketing approach to help you sell your courses AND get you clients. Good news is, it’s possible to get 24/7 sales. Bad news is, what you’re doing now is most likely not going to give you 24/7 sales. I’ve seen people in your shoes before. They drool over Facebook ads leading to a sales mechanism that produces cash on autopilot every hour. People search for the ONE FUNNEL that’ll make them thousands. But I’m going to dash your dreams. You won’t be riding a tidal wave of cash if all you’re doing is trying to build one funnel for paid traffic. You need a more active approach. And that’s what this guide is here to show you. 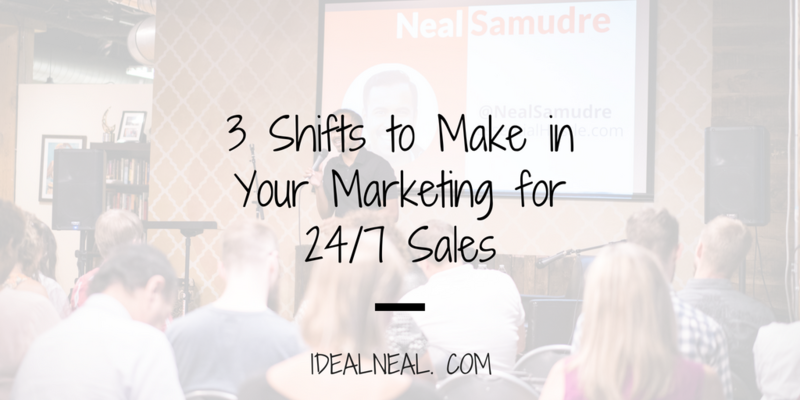 With just 3 simple shifts to your marketing, you can enjoy 24/7 sales … without building complicated, time-consuming funnels. My name is Neal Samudre, and I’m the personality behind Ideal Neal, the greatest life and marketing website on the Internet (no bias at all). I’m no going to give you fluffy life and marketing advice. On the contrary, I’m going to be real with you. You see, I became an entrepreneur when I dropped out of grad school … just 1 month before my wife and I got married. Pressured to make entrepreneurship work for my new family, I hustled 24/7. I blogged, did cold outreach, made videos, did a product launch, etc. My new family was hovering just above the poverty line. Have you heard of the 80/20 rule? Where 20% effort leads to 80% results? Well, I realized I was spending 80% of my time marketing, and seeing only 20% results. I had switched the numbers around, and it was bringing me nowhere. Once I realized this, I made the necessary moves to simplify my marketing and increase my sales. As a result, I finally turned my business around, making around $30k/month just by myself. All of this was a result of an 80/20 shift to my marketing. Want to know what’s even crazier? After I made this shift, I helped other businesses simplify their marketing efforts with 80/20 marketing strategies. For example, I helped one of my clients make $15k from just ONE email sending to ONE simple funnel. I also helped another client gain 44 new coaching students on the first day we launched a SIMPLE campaign. Online marketing is unnecessarily COMPLEX. There are too many “gurus” who are selling a complicated system for getting clients and course sales. Why? Because they want you to buy their products! Their marketing strategy is to confuse you to the point of buying from them. As a result, hard-working entrepreneurs are inundated with strategies that simply don’t work. They’re told to blog 24/7, throw all their money at Facebook ads, and buy 20 pieces of software they don’t need. The best performing funnels were the most simple ones. And it was the SIMPLE funnels that rose to the top. To explain, copywriters and funnel builders have a front-row seat to all the ebbs and flows in online marketing. We see what’s working before anyone else does. While in the past, product launch and nurture campaigns performed well, now the trends are swinging back to SIMPLER marketing. And this is because consumers NEED simple. They’re flooded with advertising and information 24/7. Without a marketing system communicating simply to them, they’re lost. While other Internet marketers are spending MONTHS (even years) trying to build their complicated funnels for acquisition and sales, you have the opportunity to build a powerful and simple system in the next 30 days. You have the opportunity to launch fast and claim that 6-figures sitting in your business. You have the opportunity to beat out your competitors who can’t get over the idea that their marketing needs to be complex to work. Have less variables so you know what to tweak if your funnels aren’t performing. This is why the crux of this marketing system focuses on SIMPLE. FIRST: This system is about consistency. Anything great in life is about consistency. If you go to the gym consistently, you will be fit. If you read consistently, you will be smarter. Consistency helps this marketing system build off itself so over time you have hordes of people coming to you (you’ll see more of what I’m talking about later). SECOND: Paid traffic is not a life-saver. Most people think this system will just have cold traffic running into a funnel that’s automatically producing sales. This is not how this system works. While there’s a place for paid traffic in our strategy, you must understand that you can’t jump to paid traffic too early. Instead, leverage any organic means you have for clients and sales to generate profit (for reinvesting in traffic) AND validate your offer. Without this validation, your paid traffic will not last long. I’ll reveal later on the best way to validate your offer organically. THIRD: This is a long-term strategy. While this marketing system does include a way to get a windfall of cash, it’s also about providing you with LONGEVITY. Once you build this system and are consistent in managing it, you will have a system that performs better with age. It’ll build on itself until it becomes a reliable source for clients and sales. Before I reveal my strategy, let me give you a brief overview of the framework. You’re probably thinking you need to run cold traffic to a funnel if you want clients and course sales flowing in 24/7. But the truth is, marketing is not this easy. Sorry for bursting your bubble. Ad platforms like Facebook and Google are INUNDATED with businesses buying traffic. When these platforms were just getting started, businesses had a real opportunity to reach their audience and have them engage with their content. The glory days are now behind us. Consumers are used to seeing a billion ads flood their Facebook. They’re almost conditioned to ignore them. This isn’t to say paid traffic doesn’t work. It just means you need to be smarter with your paid traffic, and not give up when you don’t get sales after 1 day. I repeat: paid traffic will NOT save your business. Instead, you need a marketing ecosystem. … So on and so forth. To reiterate: instead of having just one funnel do all your marketing for you, you need different elements all working together in unison. There are several reasons why this works, but the most important reason is so you engage your prospects on multiple platforms. It’s the same reason why follow-up is so effective—in the noise of marketing today, you keep your messaging top of mind for your prospects. Messaging: first, you hone in on your messaging and get crystal clear on why someone would buy from you. You also make sure your offer is high-value, so it practically sells itself. Marketing Ecosystem: once the messaging is refined, you build out the different elements of your marketing. This includes the Facebook group, the Messenger list, your email list, ad copy, and a simple funnel to get leads. Momentum Campaign: finally, you create a simple marketing campaign (relies primarily on copy) that jumpstarts your marketing, captures the attention of your market, and pulls them into your marketing ecosystem. You’re probably wondering how the ecosystem sells courses and acquires clients 24/7, right? Get this … instead of relying on complicated funnels that break, requiring a ton of upkeep, and cost a ton, you write what I call, ATTRACTION COPY, in your ecosystem. If you’re consistent with producing sales-worthy copy, you don’t need fancy funnels to sell. Using just your words, you can invent money out of thin air. Your copy is the 20% effort, and your sales will be the 80% result. Let’s break this down even further by diving into the 3 steps. Your message is the most foundational piece of your marketing. When it’s crystal-clear and honed in, then your message should do the work of selling for you. How? Well, your message will by nature hit the PAIN of your market. It will also show them the GAIN in working with you or buying your course. Your offer is NOT what’s included with what you do. It has nothing to do with your features. Your features are part of your delivery. Your offer is the RESULT you promise. If you can frame the message of your offer based on the RESULT you provide, and this result is something people want, then your offer should sell itself. You don’t have to work so hard with your marketing. Your marketing will become less about nurturing and educating, and more about SALES. You can make fast cash. The faster your audience understands your message, the faster they can make a decision to work with you. You can create an inbound system (where people come to you because they know the value you provide). This all begins once you make shifts in your messaging. If you are focused on attraction, meaning you just want to attract clients with one funnel and paid traffic, then you have a lot of competition to deal with. As you invest in paid traffic, you’ll find it difficult to keep up with the bigger companies who offer what you have. The only way you differ from the big companies shelling out thousands in paid traffic is in your personality. You have a uniqueness about you. And this uniqueness is exactly why people will choose to work with you over others. When you put people into a marketing ecosystem where they’re constantly being indoctrinated in your worldview and approach, then they BECOME your ideal clients. Why? Because they start believing your worldview. They adopt your philosophies. And sooner or later, they can ONLY work with you because they understand you. This is the beauty of a marketing ecosystem. If you constantly put your message in front of your clients and customers, they begin to form a connection with you until you become the only choice for them. It takes time to build relationships with people. Once you have your marketing ecosystem humming, you’ll find that people will be watching you from a distance for MONTHS before making a decision to work with you. But when they do decide to work with you, they’re the best clients and customers ever. Some people will build instant rapport with you, and book a call or buy immediately. Others however, will need to be in your marketing ecosystem for a while. If you’re consistent with posting content and messages for them, then they will convert (if they are good for your offer). To sum up: you can’t just expect to get hordes of clients and customers from paid traffic running to ONE funnel. There are gurus out there who are FOOLING you with this idea. However, the truth is, the gurus are constantly following up with their leads on different platforms. They have marketing ecosystems. It’s time for you to develop your own. A momentum campaign is the SECRET WEAPON to jumpstart your marketing. How? By capturing the attention of your market. If you want to master marketing, you need to learn how to generate attention. Once you have the attention of your market, you can breathe new life into your business. This is the purpose of the momentum campaign. It gives you the boost of momentum you need to build sustainable marketing. So how does a momentum campaign work? It depends on your assets and what you have working for you. If you have an email list, you should target your list with this campaign. If you don’t have an email list, but know a ton of people in your target audience, then you can have a momentum campaign in your personal Facebook profile. If you have buyers for a past offer, start there. Your momentum campaign is nothing more than a string of messages (emails, posts on your personal profile, etc.). They follow one another in succession and give you a windfall of new cash. It should also put people into your marketing ecosystem. First, you want to decide what mediums you want to use. I typically suggest people start with their personal Facebook profile OR a list of past buyers. Why? Because these people already know, like, and trust you. They’re easier to hook with your message. QUICK NOTE: If you think you don’t have people in your target audience as a friend on Facebook, think again. People might be perfect for your offer, but haven’t made any action because you haven’t given them an offer yet. And if you truly don’t have people in your personal profile, then go make some new friends. Once you decide your medium, it’s time to start crafting the messages. When all the messages are done, they’ll act as a mini-launch, with each message working off the last. This post generated a TON of attention. Then I followed it up with another post about how I’m creating a new offer. There’s more to this email, but you get the point. The purpose of this campaign is to GENERATE ATTENTION. But now you’re probably wondering how this campaign can help you sell both your services and your courses? Here’s my secret sauce—the staple of what makes this system so successful. For your momentum campaign, you want to sell your SERVICES first (even if you don’t want more clients). It’s higher-value. If you sell one client at a high price, this should give you instant profit you can then turn around to invest in paid traffic. It generates more attention. Again, your goal with this campaign is to generate attention. Whatever offer you have that is higher-value will naturally attract the most attention. For instance, if someone told me they could clean my house for me, OR give me a course that teaches me to clean my house, I would naturally be drawn to having someone clean my house for me. By starting with your highest-value offer, you attract attention from your entire market. This is opposed to if you released a course first, you would only attract people concerned with value and price (meaning, they would never invest higher dollars with you). Makes it easier to sell your courses. Once you sell a client spot, you can then turn around and say, “There was clearly a demand for this client spot. What if I developed a training teaching the system that I use with clients?” What happens here is, people anchor the value of your course with working with you 1:1. They start to think, “If I can’t afford to work with him 1:1, then I can at least learn his system.” And they end up buying. And that’s why you sell your services first. If you were to sell your course first, it wouldn’t have the same effect. AND, you probably wouldn’t generate enough profit to keep the momentum going with your marketing. Once you generate profit, you can reinvest it in paid traffic to keep adding leads into your marketing ecosystem. Most people believe in an ASCENSION model with getting new clients. The idea behind the ASCENSION model is that you need to walk people up your value ladder so they invest at higher price points with you. This is why people sell tripwires and low-priced products first. The idea is they can keep walking them up until they become a top-tier client. There are several problems with this idea. But the main one is that this takes a LONG time. It also produces no profit. Here, you sell your HIGHEST-PRICED offer first. Why? Because again, it gives you profit AND attracts better leads. If you sold a client at $5k, you could take half of that and invest it into paid traffic to get MORE leads. But if you sold a course for $99 dollars, you would have no money to create more opportunities for yourself. Sell your highest-priced offer first. Then sell your course as a downsell for people who can’t afford your highest-offer. When you follow this sequence, you don’t have to create fancy, complicated funnels to nurture leads who never buy. Because you’re targeting people who are at the top-of-the-crop, it’s easier to sell them WITHOUT a ton of marketing effort. Your head is probably spinning right now. I just showed you the 3 steps you need to sell your courses and services 24/7, without having complicated funnels. To summarize, it all centers on having a marketing ecosystem you consistently populate with ATTRACTION COPY (that is, copy that attracts and sells). If you are consistent with writing messages to your audience, then this system will work. This seems like more work than a passive income funnel spitting out money for me. How do I write attraction copy? With the state of online marketing today, you will not have much success with paid traffic going to one funnel. You will have more success with a system like the one I just laid out for you. Why? Because you’ll never have to compete. You’ll own the space for your audience. Secondly, if you’re trapped on what to say, don’t overthink it. Those who succeed are those who take fast action, despite whether something is perfect or not. Telling stories of everyday life. Sharing the results of your clients. But what makes this different from most content is that it specifically taps into the PAIN and GAIN of your audience. When you tell a story, it touches on a pain point of your audience. When you share the results of a client, it touches on a gain that your audience wants. With attraction copy, you’ll be able to turn ATTENTION into APPOINTMENTS and CASH. But it all depends on the quality of your copy. Now that I just gave you a firehose of content, it’s time for you to actually do the work. If these 3 shifts are done properly, you can jumpstart your sales and build the momentum you need to grow your business to new heights. All that’s left now is for you to go out there and do it. If you need to refer to this article later on down the road, bookmark it for easy access.